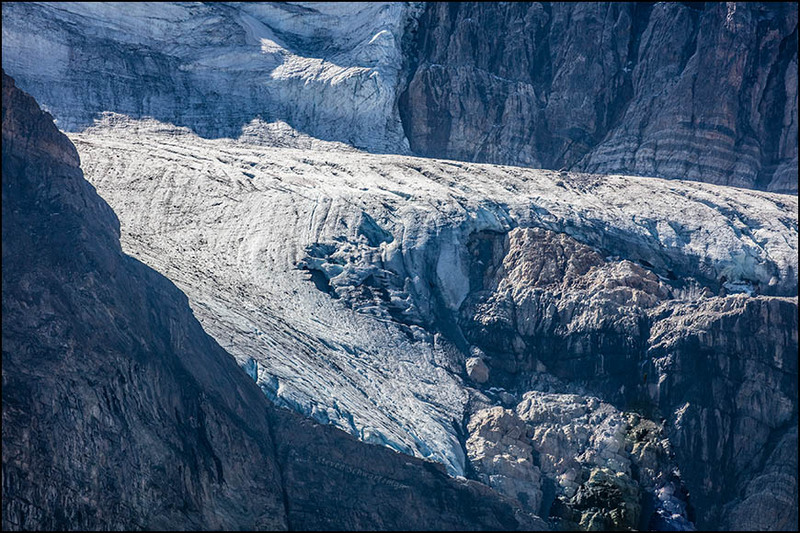 September 4, 2017, proved a long and adventuresome day in the Canadian Rockies. 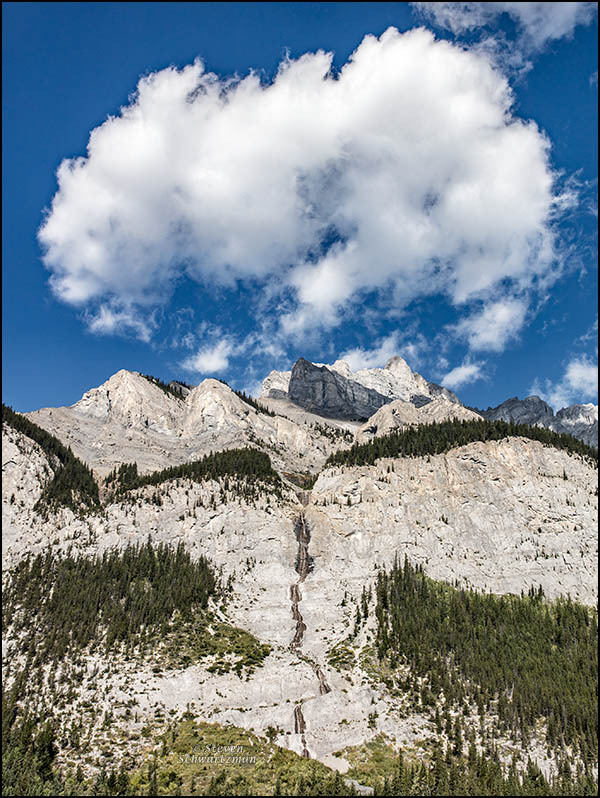 A couple of hours after heading north from Calgary we entered Banff National Park, where among intriguingly many other things I photographed the cloud-bannered fortress of rock shown in the first image. 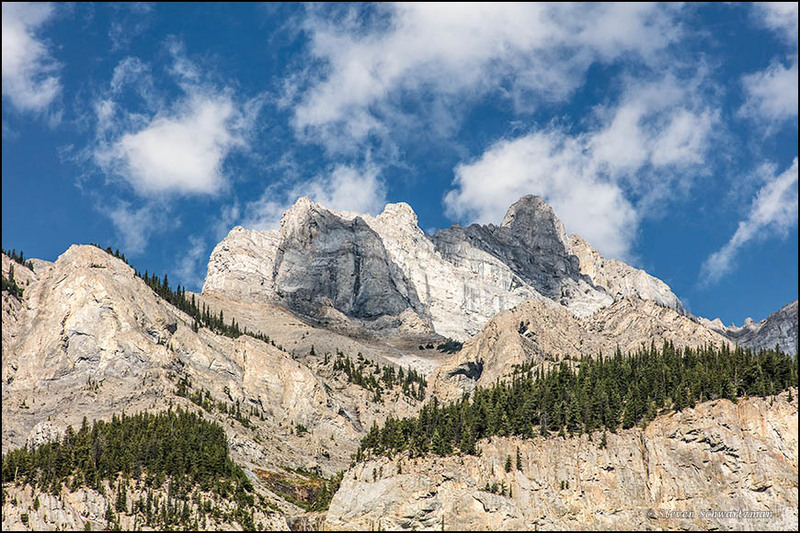 Call it Mount Rundle and you could be right. 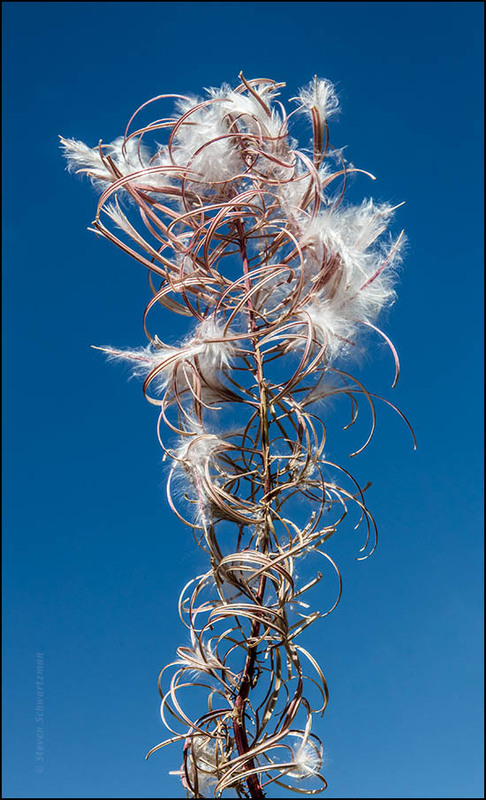 Along the noisy edge of the Trans-Canada Highway I photographed some late-stage fireweed (Chamaenerion angustifolium) divorced from its mountainy context. 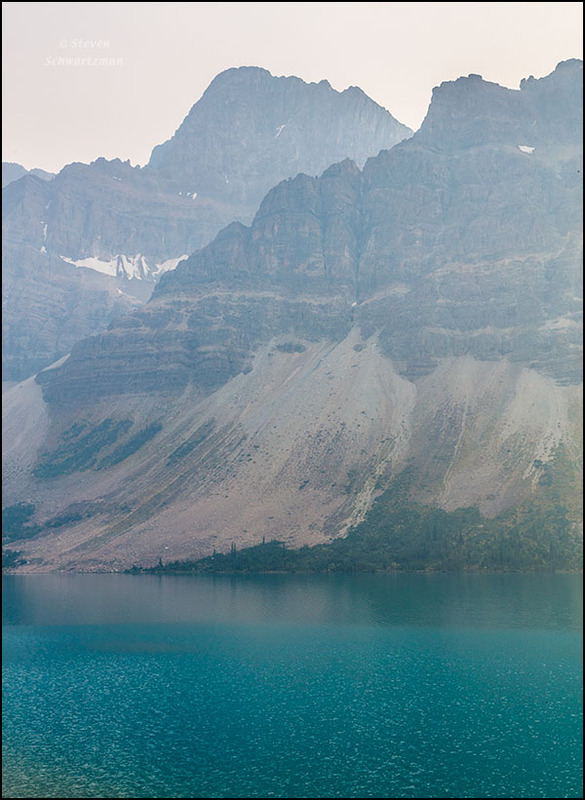 By early afternoon we reached the famous Bow Lake. 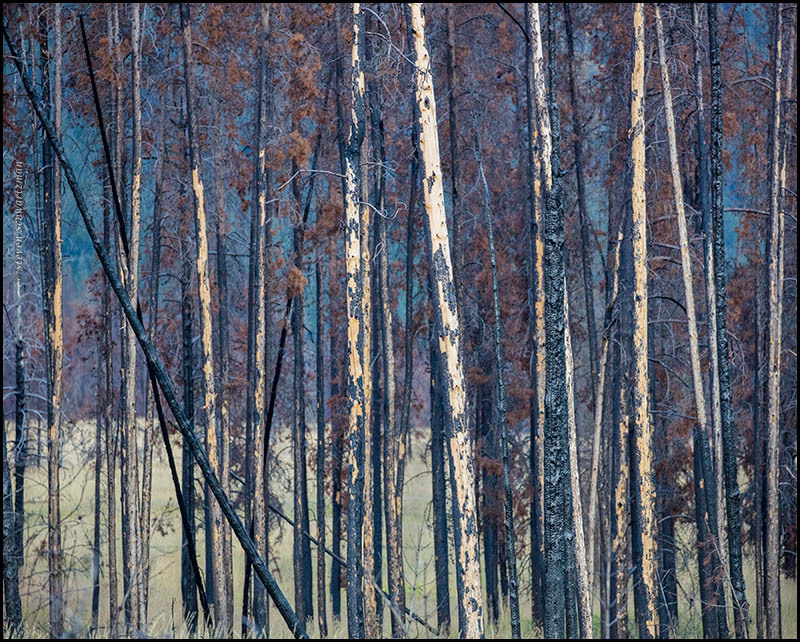 At the far end of the day, as we headed east from Jasper to Hinton, I photographed burned trees with no water in sight. Then, further along and with little daylight left, I found other trees not obviously charred but still seemingly dead that stood next to as much water as they could have wanted when alive. 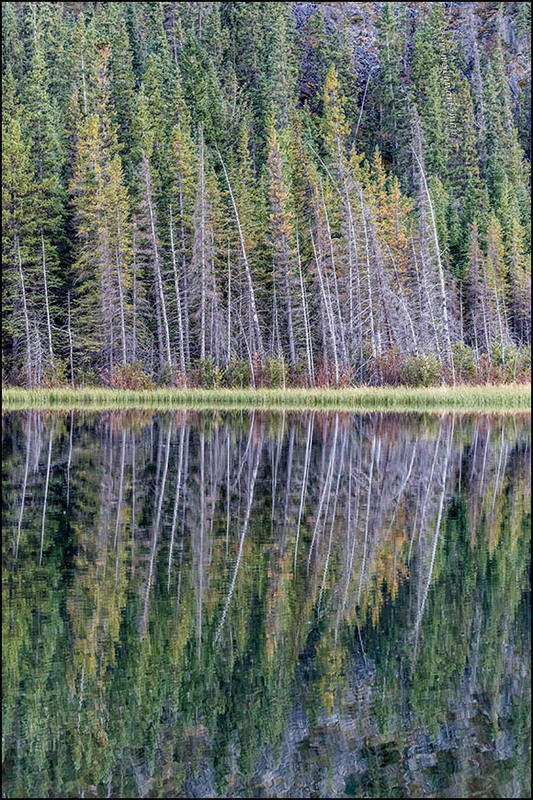 The way the water reflected the trees appealed to me. 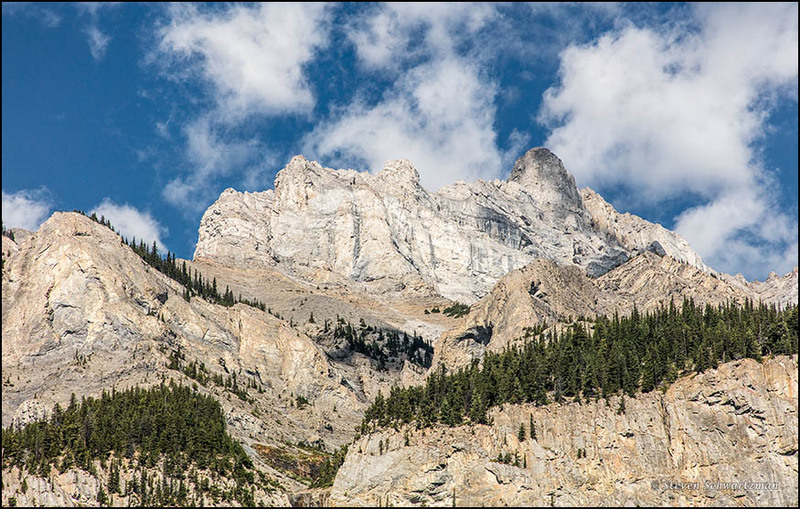 After mustering a mountain on each of the five Mondays in January, here’s one to inaugurate February: it’s Mount Jimmy Simpson in Banff National Park, Alberta, as we saw it from the Icefields Parkway on September 4, 2017, one of the few clear days on our trip. 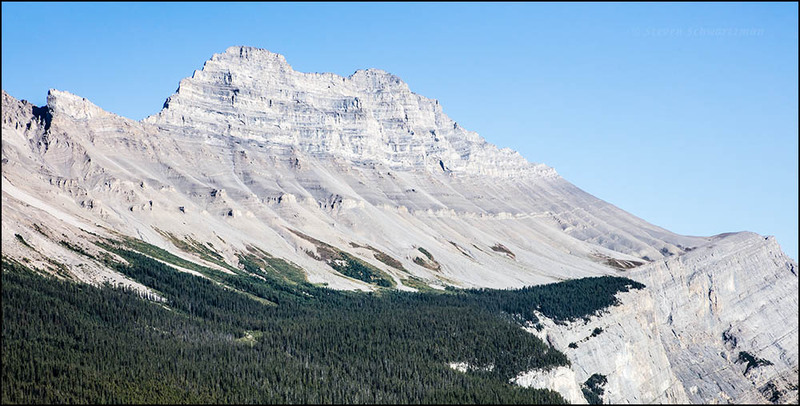 Thanks to the diligent researchers at Travel Alberta for identifying the mountain. 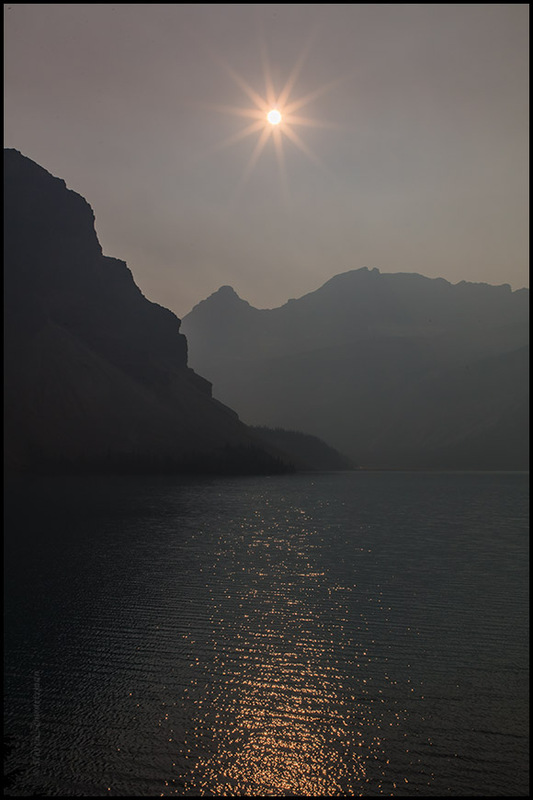 When I stopped again at Bow Lake along the Icefields Parkway on September 6th last year, in addition to taking the regularly exposed photographs you saw last time, I took a few that I underexposed by three f/stops* so I could include the sun without blowing out the pictures’ highlights. The technique allowed for some solar drama that would have been lacking in a conventional exposure. 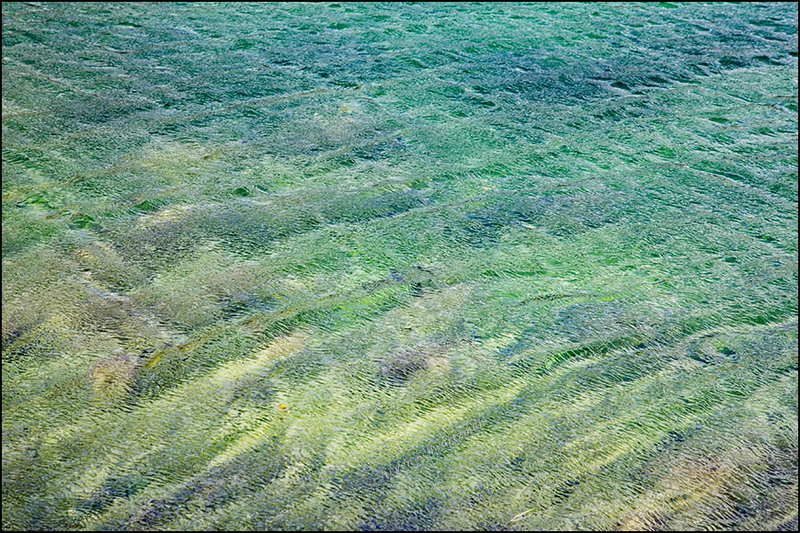 While that degree of underexposure robbed the water of its pretty blue, it partly compensated by allowing the sun to reflect some of its favored colors off the water’s surface. Also notice how clearly defined and regularly spaced the 10 rays of the sunstar are, thanks in part to a tiny aperture of f/22. Oh, the tricks we photographers resort to. What goes up must come down, or so they say. 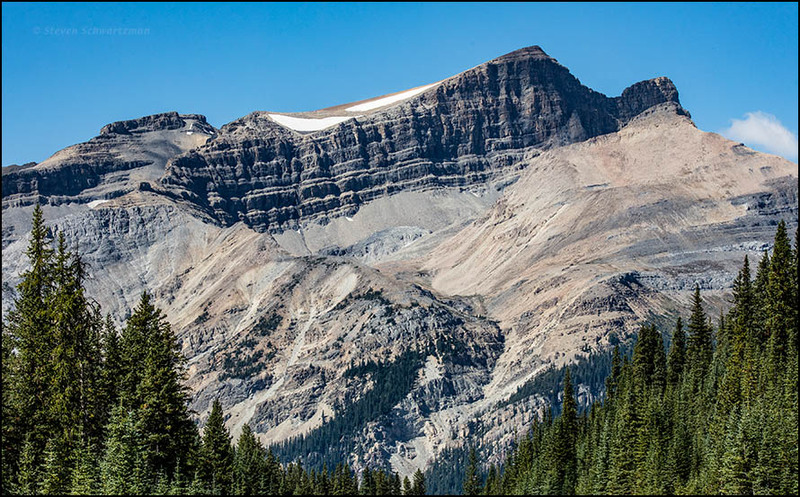 Even if that’s not always true, it was true for us with regard to Alberta’s scenic Icefields Parkway. On September 4th last year we drove up it and on September 6th we came back down. 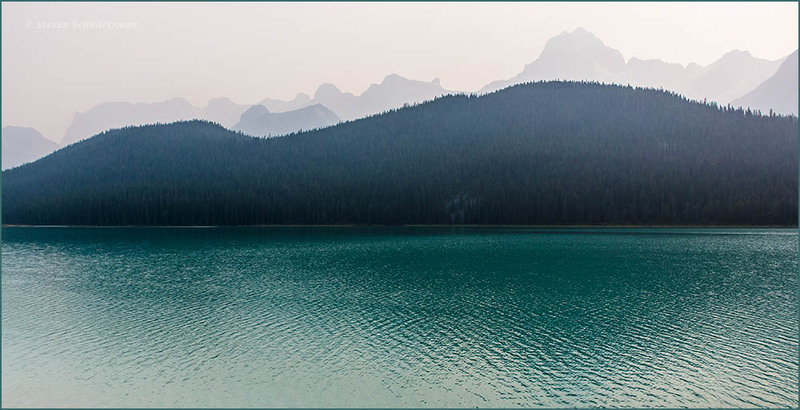 You’ve already seen a conventional view and two abstract views of Bow Lake from the northbound trip. Now add a couple of looks at the lake from our southbound trip, which gave us smoky haze rather than the clarity of two days earlier. 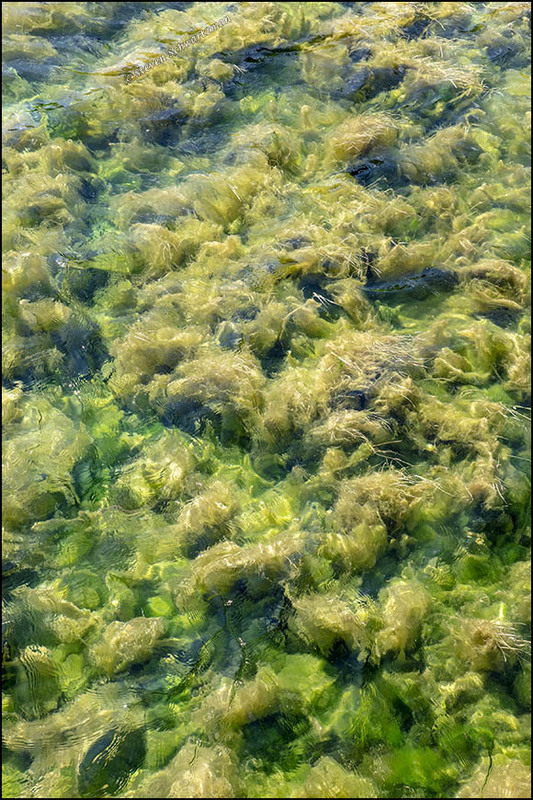 Nevertheless, you can still see the beautiful color imparted to the lake’s water by what’s known as rock flour or glacial flour. You can also confirm that some patches of snow and ice remained in the adjacent mountains even at the warmest time of the year. The many Mondays this month let you marvel at mountains. 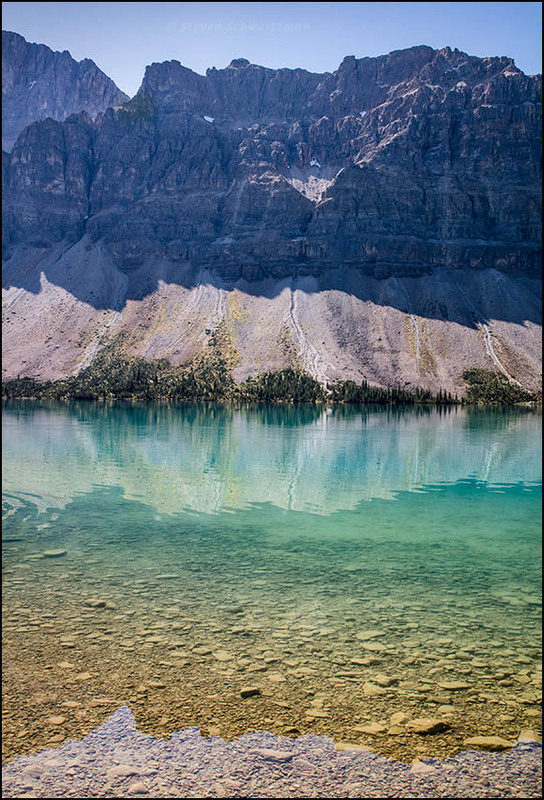 This time it’s the grand sweep of Cirrus Mountain in the northern part of Banff National Park, Alberta, recorded on September 4, 2017. Thanks to the good folks at Travel Alberta for the identification.